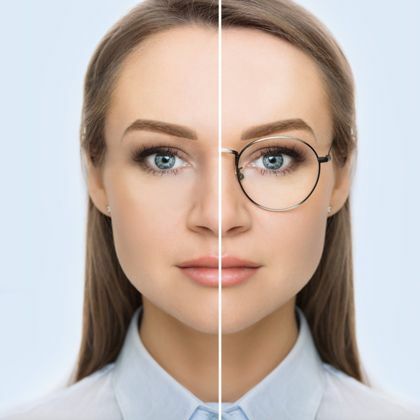 Wearing glasses or contacts can feel like a hassle, but it can be impossible to go about your daily life without them if your vision is impaired. LASIK eye surgery can restore your vision, making your life easier and improving your confidence. LASIK, a type of refractive surgery which reshapes the cornea, can correct myopia (nearsightedness), hyperopia (farsightedness), and astigmatism. At Grin Eye Care, we perform completely bladeless LASIK using advanced laser technology. We offer free LASIK evaluations at our Olathe and Leawood offices to patients who are interested in pursuing this treatment option. Contact us today to learn more about LASIK and to schedule a consultation with one of our doctors. LASIK patients usually do not require sedation or general anesthesia. We will administer local anesthetic drops to numb your eyes. During surgery, your doctor will use a lid speculum and suction ring to ensure that your eyes stay open and still. Your doctor will guide our sophisticated IntraLase® iFS™ femtosecond laser with a computer to create a circular incision in the outer layer of your cornea. This flap is then pulled back so he or she can access the deeper layer of corneal tissue, the stroma. Next, an excimer laser will apply rapid pulses of light. Your surgeon will remove microscopic amounts of tissue to optimize the shape of your cornea so that you can see properly. The speed of the pulses reduces the heat of the laser beam, which minimizes inflammation, improves your comfort during surgery, and promotes faster healing. Once this step is complete, your doctor will place the flap back over your stroma so that it can heal naturally. Each eye typically takes about five minutes to correct. After LASIK, you should have a friend or family member drive you home, since your vision may be blurry. Your eyes may also burn or itch for a short period after surgery. Many patients notice an immediate improvement in their vision, but it can take a few weeks or more to enjoy the full benefits of the procedure. Have healthy eyes, free from dry eye syndrome, glaucoma, or cataracts, as these can interfere with surgery. Any infection or indication of pink eye (conjunctivitis) must first be addressed. Have a sufficiently thick cornea, so that there is adequate tissue for reshaping. Not have pupils that are especially large, as this can increase your risk for glare, halos, starbursts, and other light sensitivities after surgery. Not be pregnant. Hormonal changes can temporarily change your cornea shape and make your eyes drier. Have stable vision. If your glasses or contacts prescription changes frequently, the surgery may not be as effective. Be in good overall health. Although it is minimally invasive, LASIK is still a surgery, and your body needs to be able to heal properly to minimize your risk of complications. Our doctors will help determine if you are a good candidate for LASIK during your initial evaluation. At Grin Eye Care, we strive to provide you the best quality surgery with the latest technology at a price that fits into your budget. The cost of LASIK depends on many factors, including your glasses prescription and any coinciding eye disease. A free LASIK evaluation in our office is the best way to determine how we can best meet your personal needs. If you are ready to correct your vision and lessen or eliminate your need for glasses, contact our office today to schedule your free LASIK evaluation.